I’m all about mythology and modern takes on mythology. The Greek myths are especially interesting to read because they come filled with all their own drama. You don’t really have to look far to find a scandal. That’s why I was excited to give Cabot’s version of the Persephone myth a try.The story of Abandon takes place in two ways. We look at Pierce’s life now and how people think she’s adjusted after a near death experience, and we look at what happened during that near death experience through flashbacks. Pierce has her reasons for what has happened in the year and a half since she nearly died, but she can’t fully explain them to people. Her trip to the underworld has given her questions and problems she isn’t sure how to handle. Not only is she struggling to understand what happened to her, but trouble keeps finding her and John magically appears ready to save her. Pierce’s heart is good and she cares a lot for people, but that caring let’s bad things follow her. I’m hoping that in the next novel, she finds some strength in standing up for herself and being a little bit selfish. I can overlook it because I can sense Pierce’s confusion about what is going on in her life. She doesn’t have the ability to think for herself when she’s trying to protect those around her. The romance between Pierce and John felt a little stilted, but they weren’t the real focus of this novel, in my opinion. Their relationship felt a little rushed, but I’m hoping Underworld takes the time to flesh it out and make it bloom. The focus of this novel felt more centered on the necklace and setting up Pierce’s history, which worked well for me. It gave me the background to understand Pierce and where she is coming from. As a retelling or reworking of the Hades and Persephone myth, it didn’t quite stand up. It does however, provide the set-up for the myth. I’m hoping to have more of the mythology come into play in the next novel. From how Abandon ends, I think this is where Cabot is taking it and I hope I’m right. 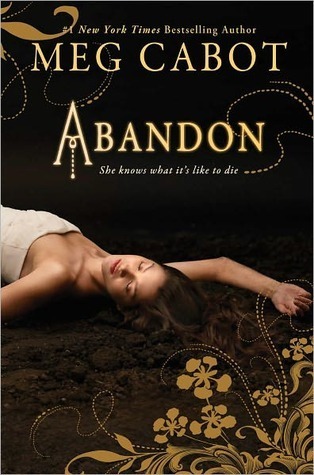 Abandon is a good novel to begin a new mythology series. It provides an excellent set-up for the world we are about to enter and leaves questions and puzzles open. It wasn’t quite what I had been expecting, but it was still good. I’m looking forward to reading what comes next for Pierce and John. This entry was posted in Contemporary, Something a Little Different, Young (and New) Adult and tagged Fantasy, Meg Cabot, Mythology, Paranormal, Young Adult. I love mythology and modern takes of it as well! Do you have any other recommendations? The Starcrossed series by Josephine Angelini was a good mythology remake, in my opinion. I have a few mythology series that I’ll be reading soon, so hopefully one of them will be a good one.